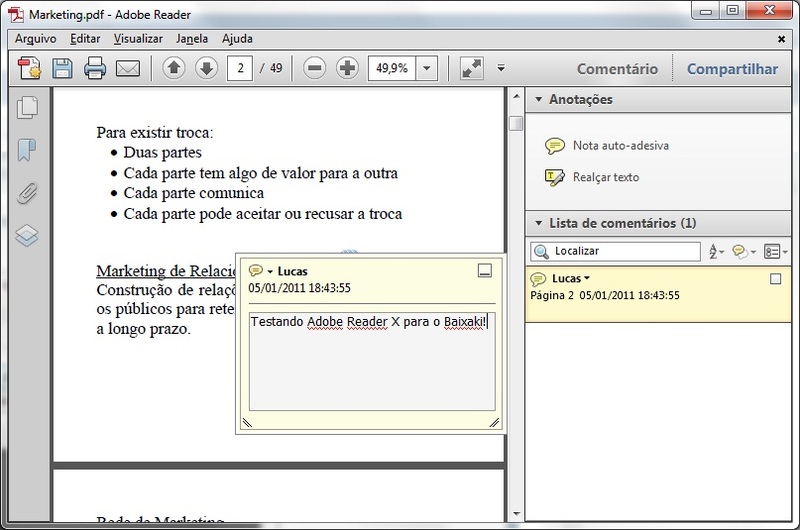 This version of Adobe Acrobat Reader DC is not compatible with your operating system, veja a versão compatível. Ele já foi acusado de roubar recursos, pois quando usado deixava o computador lento. Depois acabou inchando o suficiente para muitos o considerem tipo um moai da Ilha de Páscoa, um enfeite grande demais para permanecer dentro do micro. Mas nas últimas versões a Adobe tem acrescido bons recursos e melhorado a performance do Adobe Reader. E com os HDs de Terabytes e uma freada no inchaço das bibliotecas, o gigante tem encontrado lar nos computadores dos usuários. 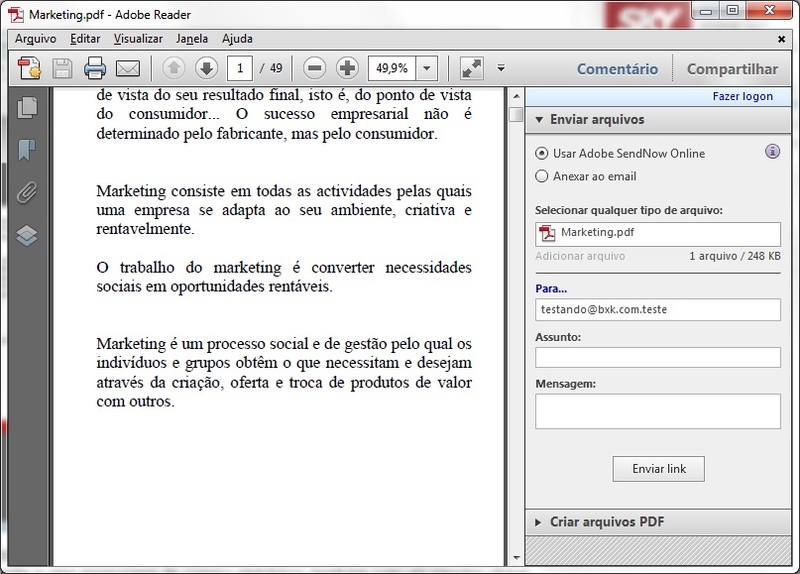 O Adobe reader está em uma boa fase e continua sendo o mais completo LEITOR de PDFs grátis que há. For more options that exist for reading PDF documents, it is not possible to say that any of them is actually better - at least technically - than the tool developed by the creators of the format. Adobe Reader further increases the distance between it and its competitors by becoming more agile and more secure without losing functionality. The advantages of Adobe Reader are perceived from the very first launch of the application. Software loading is much faster, both in windows as well as as a plugin in browsers. Opening PDF files has already been considered a quiet and safe activity. But with the advancement of technology and new options the format has brought - such as video viewing and form filling - threats and weaknesses hitherto unknown began to be exploited by malicious people. Because multimedia features and document interaction use definitions and libraries from other programs in addition to the PDF reader, data exchange between Adobe Reader and libraries, for example, allowed malicious code to take advantage of that loophole to include viruses or other malware on the computer that opened that document. Adobe Reader uses a well-known method - the sandbox - to reduce this risk. Adobe Reader XI's "Enhanced security" is very similar to the existing "sandbox" mode in Chrome and other applications for Windows 7 and Vista, limiting the access of information from documents to other parts of the computer. This mode is standard since the application was first initialized, but can be reconfigured in Adobe Reader preferences. Sharing has been a trend in the online world for a long time, and now comes to the Adobe document reader. Thanks to the integration with the SendNow service, sending very large files to a group of users, depending on the account classification in the company service, becomes as easy as sending an email. When the file to be shared is not so large as to require SendNow or an FTP, the document can be automatically attached to an e-mail message, also with a simple click. Another interesting possibility that appears for the first time in Adobe Reader is the creation of PDF files from the official online conversion service. Adobe CreatePDF allows you to create PDFs directly from Adobe Reader XI, or programs such as Word or Excel using the "Print to PDF" option. Though possible in earlier versions of the program, notes have been enhanced in Reader. A side panel displays annotation tools - "Sticky Note" or "Highlight Text" - and a list of all notes made in the document, making it easy to find a particular citation or important passage of the text. Likewise, the copy of images or text passages in Reader also received news. The "Take snapshot" tool within the "Edit" menu copies a region selected by the user to the clipboard. When you paste this area, an image is positioned, reproducing the chosen content. In addition to security and speed, Adobe Reader XI leverages concepts from Adobe Digital Editions and other company experiences in the world of e-books in "Read Mode". Featuring fewer on-screen controls, the application offers a more enjoyable interface for continued reads. Even if it is not a real substitute for software dedicated to digital book reading, in a time of extreme need or impossibility when installing Digital Editions, Reader XI can serve as an alternative. improved protection mode with data theft prevention functions. Another big plus of the latest version released by Adobe is the support for new 23 languages, which can reach the audience of 38 countries. And to our satisfaction, the Brazilian Portuguese is among them. Adobe Reader is always a great suggestion for anyone looking for a reliable reader. The look of this version is very nice and has the same practicality as the previous ones. Its main tools are always at hand and make your work much easier. It also has a huge amount of tools and options, ideal for advanced users. This program can be considered somewhat cumbersome for a reader of PDF files, but the user needs to take into account that it is not another simple program of the genre. Among the main advantages of this version is the possibility to play flash videos within the documents and integrate with online services. Such a feature left the program susceptible to security breaches for a month. However, the problem has been solved and now the user can rest easy. 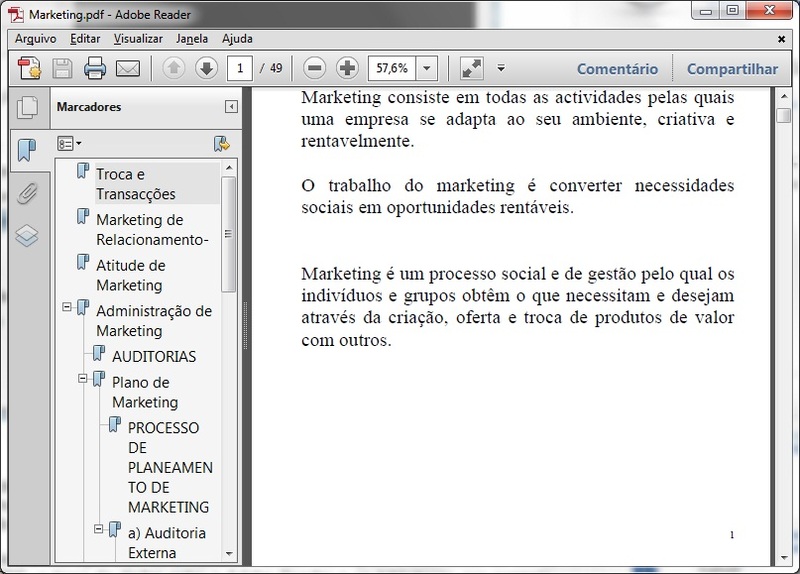 Undoubtedly, the most reliable and practical option in PDF readers now in a fully Portuguese version. We did not find any positives. We didn't find any negatives.